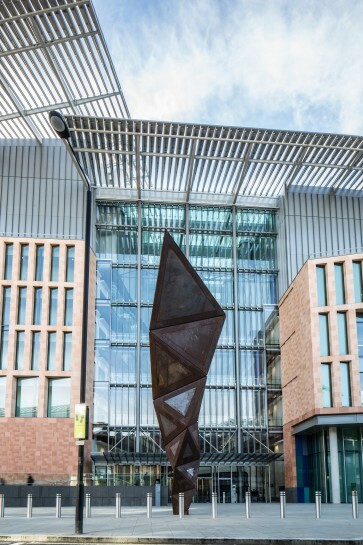 Commissioned by the Francis Crick Institute and funded by the Wellcome Trust, Paradigm, by artist Conrad Shawcross, is one of the tallest public sculptures in central London at an imposing 14 metres, comprising a twisting stack of tetrahedra that grow in size. The work is a feat of engineering and continues the artist's long-standing collaboration with structural engineering practice Structure Workshop. Thomas Kuhn's theory of the 'paradigm shift' provides a starting point for Shawcross' work for the Crick. Kuhn, an American philosopher of science, believed that scientific advancement does not progress in a seamless linear fashion, but rather through massive shifts that lead to breakthroughs, which change the course of thought, comprehension and application. Paradigm provides a metaphor for potential: to grow; to advance; to discover. Its majestic form embodies boldness and courage whilst the material it is constructed from (weathering steel) gives a respectful nod to the industrial heritage of the area.